LAS VEGAS. The referee assigned to work WBA welterweight champion Sen. Manny Pacquiao’s title defense against challenger Adrien Broner will carry some baggage into the ring at the MGM Grand Garden Arena here tonight (tomorrow morning, Manila time). Russell Mora was severely criticized for poor officiating in the IBF bantamweight championship fight between Mexico’s Abner Mares and Ghana’s Joseph Agbeko in Las Vegas in 2011. IBF president Daryl Peoples chastised Mora for his “inappropriate conduct that affected the outcome of the bout.” Mora repeatedly warned Mares for low blows but never deducted a point and worse, he gave Agbeko a mandatory eight-count in the 11th round when it was clear the knockdown was caused by a punch below the belt. It will be Mora’s first assignment for a Pacquiao fight. One of the three judges Tim Cheatham will also make his Pacquiao debut. The two other judges Dave Moretti and Glen Feldman were in the panel for Pacquiao’s fights against Jessie Vargas and Floyd Mayweather, Jr. Moretti was a judge in Pacquiao’s third fight against Tim Bradley, the first two Erik Morales bouts, the third Juan Manuel Marquez encounter and the wins over Sugar Shane Mosley, Miguel Cotto and Oscar de la Hoya. Feldman was a judge in the Lucas Matthysse fight in Kuala Lumpur last July. Mora is no stranger to Filipino fans. He was the third man in the ring when Donnie Nietes beat Francisco Rodriguez on points to retain his WBO lightflyweight crown in Cebu in 2015 and when Nonito Donaire, Jr. kept his WBO superbantamweight belt via a third round demolition of Zsolt Bedak in Cebu in 2016. Two more Filipinos whose fights were worked by Mora were Gerry Penalosa and Aston Palicte. In 2010, Mora was the referee when Penalosa lost a split 12-round decision over Eric Morel in an interim WBO bantamweight title fight in Las Vegas. Penalosa said Morel repeatedly butted and left him with lumps on his face but Mora never deducted a point. “He hardly interferes,” said Penalosa. The downside of being tolerant is it could lead to condoning dirty tactics. In 2011, Mora worked the WBC/WBO bantamweight title fight between Donaire and Fernando Montiel in Las Vegas. Once more, Mora’s decision-making was questioned. Donaire sent Montiel crashing down in the second round and as he lay on his back, the Mexican’s legs and hands shook involuntarily. Mora was out of position when Montiel fell and had to step over him. His back was turned when Montiel’s body twitched. Montiel beat the 10-count but when Mora motioned to come forward, the Mexican’s legs stiffened. Mora pulled Montiel’s arms towards him as to justify continuing the fight. When action resumed, Donaire swarmed all over Montiel and Mora stopped it. Considering the damage inflicted, Mora should’ve halted it outright when Montiel was floored. “Maybe, Mora didn’t see Montiel twitch but when Montiel couldn’t walk straight, he should’ve ended the fight,” said Donaire. Both Penalosa and Donaire said Pacquiao shouldn’t find it difficult to beat Broner. Penalosa said Broner is an easy target for Pacquiao whom he predicted to win by a late stoppage or a clear decision. Broner may not go down for the full count but it’s possible his corner will throw in the towel, said Penalosa who has taken charge of the Philippine TV rights for the fight. 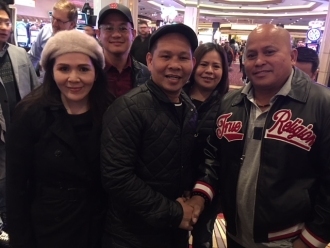 Photo: Former world boxing champion Gerry Penalosa, his wife Goody and Gen. Bato de la Rosa are in Las Vegas to witness WBA welterweight titlist Sen. Manny Pacquiao’s fight against Adrien Broner.